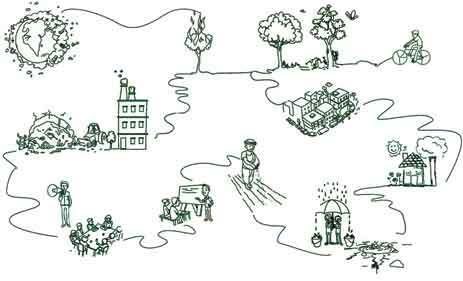 Sustainability thinking has environmental, social, and economic dimensions. It is a way of looking at these issues in an integrated manner without straying from paying attention to either the human development problem or the value and constraints imposed by our environment. This kind of thinking requires understanding, debate and action, especially in our educational institutions. At Wipro, we have endeavored to work on both the educational challenges in schools and colleges and on ecological sustainability issues within our organization and outside. From our work in these areas came this realization that sustainability issues require greater attention in schools and colleges. This was the genesis of the earthian program launched earlier this year. The vision of earthian is rooted in the challenging task that humanity faces of finding solutions to several sustainability issues – climate change, water scarcity, rapid urbanization, biodiversity loss – to name just a few. The fact that solutions will have to be found to these challenges even as we ensure balanced and inclusive economic growth will require an exceptional calibre of leadership from our future generations. Those in schools and colleges today will be our future policy makers, technocrats, administrators and educationists who will lead this change. This program is positioned distinctly – both in structure and expected outcomes. In the first phase of the program, we asked teams to write critical and well reasoned essays on various themes – by looking at issues through the lens of different socio-economic contexts and exploring interrelatedness of issues. We had debates on what is the right medium of expression for schools and colleges. We thought writing, a skill that is increasingly marginalized in the present times, will engage multiple faculties and take them through the rigour, which one may find hard to see in other mediums – like a slide presentation, video, or collage. To get a drift of the approaches being taken, we invited teams to submit a brief before the main paper. We received over 1000 abstracts. In a majority of abstracts it was hard to find original material and the teams focused on technical detailing; some proposed that their one solution would solve the issue(s) and very few explored multiple dimensions of the problem. This interim feedback was sent to participating teams – not to treat this as a typical essay completion, but to treat it more like a painting – multi layered and original, universal but grounded. At the final count, we have received more than 800 entries, 60% of them from schools. The best entries are being selected by an eminent jury comprising people with varied experience in academia, research, non-governmental organizations and business roles. Even though the evaluation criteria and selection process are in place – picking a few best entries will not be easy, as there is no single yardstick for measuring an understanding of sustainability. The selected teams will be awarded at a daylong forum in Jan 2012, which will see a mix of sessions and talks from people in the field of education and sustainability – along with a sprinkling of fun and infotainment programs. In the second phase, the selected institutes will be part of a long-term continuous engagement program – in many ways the core of earthian. We aim to work towards embedding sustainability into the education system through faculty programs, school activities and projects within the institute and community and other networking forums. The success of the program is in what we will be able to do in these areas. A long-term program of this nature will have to be supported and guided by like-minded partners and experts in these areas. The earthian team is looking forward to working with partners, schools and colleges – to create an impact and sustain it. This is an annual program – the future editions will be launched every year in the February-March timeframe. Going through the hundreds of papers written by schools and colleges dealing with these complex challenges has been a rewarding effort for us. It was fun and at times very insightful. Hope that in case your school hasn’t participated this time, you could register a team in the 2012 edition and support and encourage sustainability thinking in your school. For any queries write to earthian.contact@wipro.com.